You are here: Home / Archive Contents / What is Happening to America? Those of us who travel a great deal in the work we do sometimes awaken in the morning and wonder exactly where we are. As I have watched the unfolding news of the past weeks, I have wondered, "What country is this? What is happening here?" In just a few days our government has launched an all-out drive to admit homosexuals into the military, abolish the law banning abortion counseling at federally funded clinics, and moved to admit aliens infected with AIDS, and other venereal diseases. For several years the effects of humanism, hedonism, and blatant immorality have been more and more evident. But now it seems that all the brakes have failed and that we are on a downhill rush to destruction. "Righteousness exalts a nation but sin is a reproach to any people" (Prov. 14:34). A recent article in this publication by John Smith about work which he and others have done in Moscow and other former Soviet Union cities was thrilling. He told of standing in classrooms of students from elementary through the University of Moscow itself and teaching the Bible to interested students. Not only is that permitted there now, but teachers may be paid to teach the Bible in public schools. I thought, "How wonderful this is." Then I was overcome with sadness to realize that we cannot do that in the United States. We can teach evolution here, but not creation. We can teach sexuality but without biblical morality. We can teach family relations but must include communal living, homosexuality and lesbianism as "alternate lifestyles." We can teach "death education" but without spiritual values by which life and death must be considered. Peer pressure on our children from the products of broken homes who drink, use drugs, carry weapons, employ foul speech become the daily moral climate in which our children spend six to eight hours. Television, movies and much of the music of the day are mocking religion and righteousness and preaching moral anarchy. David Posey of Huntington Beach, California reported recently in Lighthouse published by the church there, the results of a survey con-ducted by the Barna Research Group which was published in the October-November issue of Ministry Currents. If what is reported here is correct, then we have further evidence as to the reason many of the things mentioned here are happening. Absorb this if you can. Of those surveyed, 90 percent say they are "Christian." 40 percent claimed to be "born again." 51 percent believe the Bible is God's word. 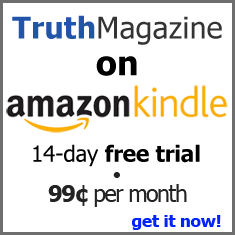 66 percent say there is no absolute truth. 63 percent cannot name the four gospels and 58 percent cannot name half of the 10 commandments. If that figure "66 percent say there is no absolute truth" is correct, or anywhere close to it, that would explain our difficulty in leading people in this nation to obey the Lord. Let's face it, brethren, we are a decided minority in this country of ours! Even among brethren, 1 am fully convinced there are many who have bought into the humanistic philosophy that there is no absolute truth. The way too many of us live shows evidence of compromising with the world around us. It shows in our speech, dress, attitudes and priorities. We have temporized with God's design for the family. The notion of one man for one woman for life is an object of scorn in the world at large and rejection to suit our convenience even among us, and there are preachers aiding and abetting this onslaught on the sanctity of marriage. Role reversals in families are often found among those claiming to be Christians. Career women have fallen into the mold of the Feminist agenda and woe be to that preacher who has so little judgment as to say something about it! Classes and sermons on the family, citing basic Bible texts on the subject, sometimes lead to heated opposition. There are some elders and preachers wives who have been bitten by this humanistic bug. The times are indeed changing. Dedicated Christians are a decided minority. But so were the small band of disciples called by our Lord to become "fishers of men." The Graeco-Roman world chased after all sorts of vain philosophies. Knowledge of the true God was scant. Even the Jews who had the law and did know, were divided into warring sects and did not faithfully keep it. Have you read Romans 1:18-32 lately? Why don't you stop right here and read it? Atheism, idolatry, homosexuality, lesbianism and every sort of reprobate behavior were common place. Have you read I Corinthians 6:9-11 lately? Would you stop right here and read that again? This passage was addressed to people who were converted to the Lord from the moral degeneracy of the times. It was into such a world as this that the gospel message came and the church was born. That little handful of disciples constituted a lonesome minority against such an avalanche of evil. Make no mistake! These times will sift the Lord's people in this land. Some will prove to be chaff. But moral bankruptcy breeds hopelessness and despair. But man's extremity becomes God's opportunity. Who knows, my brethren, but that we are come to the kingdom for such a time as this. We have the saving message of the gospel to deliver souls caught in the malaise of sin. The gospel is still God's power to save (Rom. 1:16). God still uses his people to teach the lost (2 Tim. 2:2). The church is still "the pillar and ground of the truth" (1 Tim. 3:15). Sin is a terrible task master. The burden it imposes is heavy. Sooner or later many who are so heavy laden will cry out for relief and deliverance. So, what are we waiting for? We can find a cave in which to hide as did the discouraged Elijah, or else we can stand up for Jesus and be light and salt in this increasingly ungodly society. We can whine or get to work. Which will it be?